When cycling, your elbows act as shock absorbers, cushioning your upper body as you ride over bumps or uneven terrain. If you cycle with your arms straight and elbows locked, your elbow joints take a beating, which can result in elbow pain. In addition, the constant twisting of your elbows to switch gears can strain your elbows and lead to injury. When you hold the handlebars, your elbows should be slightly bent, allowing you to keep your shoulders down and relaxed to prevent neck strain. Your wrists should be straight and chin tucked in. Keep your spine in a neutral position while maintaining a straight back. By assuming the proper position on the bike, the forces you weather during a ride will be evenly distributed over your body. The position of the shifter and brake levers also should be within comfortable reach so your wrists and elbows aren’t straining to change gears or brake. Two types of tendonitis can strike your elbow from cycling. If you feel pain on the outside of the elbow when forming a clenched fist or lifting your wrist up, it can be a symptom of lateral epicondylitis, or tennis elbow. The tendons controlling the muscles for these movements attach at a tiny bump on your outer elbow and become inflamed after repetitive shocks from your handlebars. Medial epicondylitis, or pitcher’s elbow, is the inflammation of the tendons on the inside of the elbow. These tendons attach to muscles enabling you to flex your fingers and turn your wrists downward. If you’re turning your wrists up and down on the handlebars when jumping or doing drop-offs -- rolling over obstacles on a descent -- sudden yanking motions can lead to injury. If the tendons in your elbows are inflamed, apply ice to the stricken region to take down the swelling. Continue to ice the elbow for a half-hour every two hours over the course of two days. If necessary, take anti-inflammatory medicine, such as ibuprofen, and rest your elbow in a sling. After a few days off, attempt to stretch the elbow joint through its complete range of motion by bending your elbow and fully extending your arm. If the tendon pain is severe and prevents you from performing routine tasks, contact your doctor. Also, if there is excessive swelling or discoloration of your elbow, seek medical assistance. Before you hit the streets or trails, make sure the bike fits your body. Seek the help of a qualified bike fitter, who can check the key areas -- hands, feet and seat -- where your body has contact with the bike. For example, the handlebars may be too distant from your body or too close. If the handlebars are too high, you may increase the risk of lower back strain. If they’re too low, you may overextend your arms and lock your elbows while you cycle. A fitter can help you set the handlebars in proper relationship to the saddle and in such a way that the entire set-up accommodates your physique. 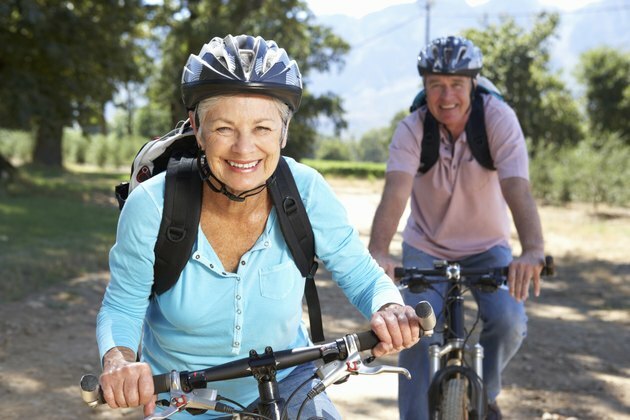 Is Bike Riding Good for Osteoarthritis of the Knee?